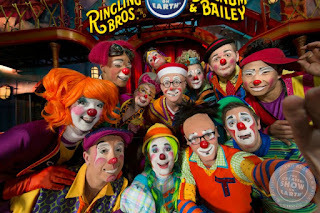 My piece in the Boston Herald today concerns, among other things, the Ringling Brothers and Barnum & Bailey circus, which is scheduled to play its final shows for all time in May. I hope you enjoy it as much as I've enjoyed the circus over the years. It's sad to see them go. Not only did i love going to the circus as a child, i loved taking my children. We went a few years ago, Mrs. C is a big fan it was down to two rings. Too much competition and too many things for people to be offended by...it was the greatest show on earth and always a fun event. When our kids were younger, we had a circus come to OurTown every year. Usually, it was one of the smaller ones, but every so often, RBB&B would come to town, and play at the university's basketball arena, where they could pack in 15,000 or so. Ringling Bros. was definitely the Big League of circuses. They'd come to town on the train, which they'd park downtown, and then have a parade for ~2 miles over to the university, passing about a block from our house. My kids would talk for weeks afterward about elephants walking down the street, right past our house. . .
And don't get me started on the whole animal-rights thing. . .
My dad took me to the circus and I cried when I saw the boxing kangaroo. And I didn't like the clowns. Still don't. Yuck to clowns.